July 30th 2012, Delhi – The very elegant Kalki Koechlin launched Myntra.com’s first fashion property called – “STAR N STYLE” at a glitzy event in Delhi over the weekend. Kalki’s handpicked selection of apparel and accessories from over 350 brands will be exclusively available only on Myntra.com! Kalki stole the show with her signature panache as she promoted her own style selection on Myntra. The star appeal with Kalki, fashion stylist Ranjunee Chakma along with India’s largest online fashion store- Myntra, made for a perfect fashion event! The brand has been on the forefront in the e-commerce fashion and lifestyle space and this initiative is a bigger step towards being the best in it. What launches with Kalki, is going to be a consistent quarterly brand property with a varied pool of influencers. Each of these influencers have been very carefully chosen from various walks of life and over the years have built a strong connect with Myntra’s chosen target audiences. Kalki’s picks will be highlighted on the website under the “STAR N STYLE” collection. The brand very aptly emulates Kalki’s à la mode, youthfulness and vibrancy. Through this launch, Myntra offers its customers to smarten up their style with stylish inputs from the actress. Trying to look like Kalki is now just a click away. Very carefully chosen clothes that match her current style and look are now available only on Myntra.com! Starting 3rd August, online shoppers can log on to www.myntra.com/starnstyle and get shopping! There is an Outfit Post from this event thta'll be up soon on this space.. I hope to meet him at many more events ..so that I get more gorgeous pics clicked by him.. he is just too GOOD..
At this Event I went Basic.. I wore the most Classic combo of "Black and White" . The Venue itself sepaks of Luxury and the concept of Couture Exposition by Tarun Tahiliani and Jewel Box by was AIS Glasxperts like the PERFECT combination of Royalty , Luxury and Class.. This Couture Outfit in the Special Glass Box is designed by tarun and embellished with Swaroski's thousands of Swaroski Crystals.. and Behind this you see the "Jewel-Box" where all the other Couture Pieces by the designer were displayed.. It is this philosophy that continues to shape our view of luxury and has guided our vision for this collection.“Bridal is about the bride. It shouldn’t be about trends. Women are still making polarized choices when it comes to couture, but clearly they must be true to who they really are,” says Tarun Tahiliani emphatically as he discloses nuances of his new collection. This I say is PERFECT for Mehandi and Sangeet.. If I were to wera this Sarii.. I wouls wear it with the same Head-Gear..!! Also SPOTTED Other's at this Exposition defining and representing the Couture Concept in India..
Couture Television.. Designed by Designer Himself.. This was a stall by The Entertainment Design Co. exhibitting their Couture Designs of Wedding cards, Gift boxes, Stationery boxes.. I saw Ritesh and Genilia's Wedding card among other Royal wedding cards.. BREAK The Glass Box Challenge..
Set In the small Sound Proof room on the extreme corner of the "Jewel-Box" was the "Glass-Box" by AIS Glassexperts, filled with Jewelled Couture Goodies by Tarun Tahiliani.. The Challenge was to break the glass-box with a baseball bat.. which is like impossible to break.. and possible to challenge your hearing abilities .. that's why the Sound-proof box.. The Glass Box's Sound proof room from the OUTSIDE..
And for the INSIDE Tour and Experience of '"The Glass - Box Challenge" watch this Video..
Tarun Tahiliani personifies a new kind of artist – one who uses his ideas of feminine beauty to influence the natural beauty of the Indian woman. He realized that aesthetic perfection must be built on a foundation of technical excellence. In the past 20 years, with a degree from FIT he has brought superb tailoring from Milan to meld with the Indian silhouette and set the standard for elegance in the Indian woman. He has a special place in the hearts of those women who remember the anxious wait for their first outfit from the Tarun Tahiliani Design Studio. Appointments and orders will be taken from 11 am to 7 pm. July 19th , I attended the International Woolmark Prize India Event along with a lot of fellow Delhi Fashion Bloggers. The Woolmark Company relaunched the International Woolmark Prize this year to help promote outstanding design talent from around the world, and through its design innovations inspire and educate consumers on the natural beauty of Merino wool. "Pankaj and Nidhi" were announced as the winner for the International Woolmark Prize India Award and this win was much deserved .. I LOVED the Oufti.. that they showcased during the Show.. Got an opportunity to chit-chat and pose with them aswell.. Gosh!! I could see how happy they were.. There are five regional competitions - USA, Europe, China, Australia and India – over 70 nominees across 15 countries began the journey in 2012 which will come down to one designer as judged by the most important and influential fashion industry representatives across the globe. The winners of each regional competition receive a financial grant and will travel to London courtesy of The Woolmark Company to London Fashion Week in February 2013 where they will present an entire capsule collection of Australian Merino wool and an international winner will be selected. The international winner will have his/her designs stocked by leading global retailers including Bergdorf Goodman in the USA, Harvey Nichols in the UK, 10 Corso Como in Italy, Joyce in China, Eickoff in Germany and David Jones in Australia. Some other Pics from the Event.. This is my Blog's First ever Video.. I am EXCITED and NERVOUS ..!! Hope you Guys would like it.. !! Do drop a comment..
Jaipur, July 16th 2012: Stepping from old to new: As the final year students of the Arch Academy of Design begin their journey in the fashion industry and new entrants step into their shoes, Arch has organized its annual Graduate Design Week to give the students a platform to showcase their talent and introduce them in the design industry. The instrumental Graduate Week commenced on July 14th, 2012 with a Fashion show by the current students in Hotel Clarks Amer, Jaipur from 7.30 pm. GABA - Graduate Fashion Show 2012 of the ARCH Academy of Design is a celebration to bring together a rendezvous of the individualistic emerging expressionists who would soon join the Indian Fashion & Jeweler fraternity of the future. Each year this show brings together an exclusive and design conscious audience, to come and savor the fruition of the agony & ecstasy that goes behind creating each work on the runway. The Show happened at the eco convention of 7 start property Hotel Clarks Amer at Jaipur. The show was witnessed by leading industrialists, manufacturers, fashion designers, jewelers, fashion enthusiasts, stylists, culture buffs, the press & media and alumni. Choreographed by Sheikh Shakir and music by Anup Bhatt, GABA - Graduate Fashion Show 2012 of the ARCH Academy of Design celebrated the individual expression of the fashion enthusiasts who are likely to change the face of the industry with their new and innovative ideas and fresh outlook towards fashion. The show saw a lot of fresh and young talent showcasing their collection at the fashion show. 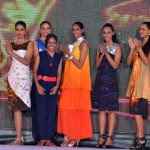 Aspring students like Anubha Sharma presented her collection. The aesthetically personified collection was dedicated to the WOMAN who lives, laughs, cries and oves. She is simple and yet she is the DIVA. presented the ’Song of Pixels’ collection that talks about the beauty of distortion in a grid and make use of well-constructed surface design and subtle usage of colors . ZAVERI BAZAAR is an assortment of jewelry collection designed and produced by the young Graduating Jewelry Design students. Students took different inspiration and designed jewelry for different markets like Vaishali Jain took her from Flora and Fauna and designed Jewelry for France using Contemporary Kundan Meena technique. Komal Khandelwals ROSHNI is a fine jewelry collection inspired from lightings and designed for Mumbai . The participants were observed by the chief guests Mr Babu Lal Nagar, State Minister - Khadi and Rural Industries, Dairy, and Mr Rajendra Bhanawat, MD, RIICO and Guests of Honor Ms Azzah Aldeghather and Ms Wasan Al Hijazi. Special Guests include Mr Rajiv Arora, Founder, Amrapali Jewels and Commodore Vijay Chaturvedi, Secretary, IIFTI. Industrialists, manufacturers, alumni, fashion designers, jewelers, stylists, culture buffs and the press & media from all over the country and beyond the national barriers also encouraged the young and vibrant designers. Temperature was raised by several degrees when super models like Aanchal Kumar, Rajeev Singh, Ushoshi Sengupta, Aakrati Raman Singh, Arshina Trivedi among others walked the ramp. Another moment of pride for Arch academy is that Nitish Rathi, student of ARCH’s design has got an entry at WOW: World of Wearable Art Award Show of New Zealand and Rupal Gupta, Jewelry Design at Academy Design is being selected in International Jewelry Design Competition by Swarovski. The GABA fashion Show 2012 was a spectacular fashion extravaganza that yet again channelized the creative energies of the talented students all set to conquer the world of glamour and fashion. 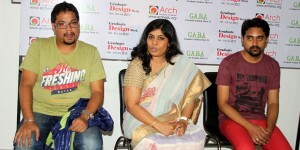 This would be followed by the Graduate Design Week till 21st July 2012 in ARCH Campus. The Graduate Design Week is a celebration of welcoming the new alongside celebrating the successes of the old. It is spread over a week and consists of various planned events during the period. The main events include Orientation Session for the new students and their parents, Exhibitions, Guest Lectures, Seminars and various other academic and fun filled workshops planned for the whole week. The ARCH Academy of Design was set up in the year 2000 under the management of the Arch Educational Society to impart specialized and industrially relevant global education in Design. The Academy offers Undergraduate & Postgraduate courses in Fashion Design, Textile Design, Jewelry Design, Interior Design, Design Management and Design Communication as well as Diploma & Certificate programs in Craft & Accessory Design, Visual Merchandising & Gemology. Affiliated to the University of Rajasthan, ARCH is an authorized study centre of the Punjab Technical University and is the only authorized Program Study Centre in North & Central India of the Indira Gandhi National Open University (IGNOU) for a Certificate Course in Jewelry Design. I think its because.. Bag is OPen..!! Those of you follow me on my Instagram (@shailykhera -find me if you don't have me..) know I shared the outfit picture, during the Fashion Week.. I am more than Happy to Announce Confessionz's Blog-Shop.. It'll go online soon.. I have been getting a lot on inquiry mails about the customized designs.. So, I have thought of sharing them with you Lovely Ladie,s through the Blog-Shop.. I would LOVE you Feedback on this..
Summer shoes are essential for those glorious sunny days when it gets hot and sweaty and your feet need to breathe a little. They might not have arrived just yet, but we live in hope, so it’s worth preparing your summer wardrobe now, just in case. The ultimate summer footwear and symbol of great weather is the flip-flop. Footwear doesn’t get any more relaxed than this. They’re great for those relaxed days when you dress down, or when you’re going to the beach or park to hang out with your friends. Of course, not every day is a flip-flop day. Luckily, there are some alternatives to flip-flops that work with more formal attire. Chief among them is the sandal. These can still keep a casual feel, but sandals can work as more formal and dress shoes as well. If you are really trying to glam it up for the night, then wedge sandals work for that too. A wedge, when worn with a maxi dress or even some evening dresses, is a great alternative to heels, especially if you are on holiday. Wedges boost your height by making your legs seem longer and giving you that extra edge of glamour for a night out. They also allow you to keep your toes cool if the temperatures start to soar. There are many different sizes and styles of wedge, from huge stack wedge heels to more subtle lifts the type you choose will depend on your personal style and comfort. This summer, patterns and bold colours are really in, so wedges will make the perfect accompaniment to a bold summer dress. Simple footwear like this will accentuate the bright dress or skirt and provide a contrast that works well too. Also, because they are sandals, they should also be relatively inexpensive, making them perfect shoes to compliment some of your summer outfits. And great for taking on those holidays where you don’t know what you might end up doing. Pack a pair of wedge sandals, some flip flops and a pair of canvas trainers and you should have all the summer bases covered for your holiday. They will also hopefully be your fall back shoes for the whole summer, should the sun eventually come out and play. And if it doesn’t, you’ll still get plenty of use out of them on your holiday to justify your purchase. Not that you really need to justify anything, of course. When recently I realised My most favourite #Forever21 Chain that says,"ELECTRIC" ..is turning dark..(From Golden to Bronze..) I realised I need to fix it.. So I just sat down for another #DIY .. I painted the "ELECTRIC" part of the chain with #NEON-PINK Nail color.. LIKE THIS..
You'll need 1.) A Nail Paint 2.) A Chain / Necklace that needs a makeover.. Paint the portion carefully with the Nail Paint Brush..
(L)"HOPE Chain was done last year..so its kinda dull now.. I might redo it now..with another color..(R) "ELECTRIC" Chain is freshly done..and has a golden chain.. Currently wearing..!! My "ELECTRIC" Chain..
By the way!! Have you Girls checked the Sale YET?? If not.. I say..Sunday(tomorrow) is the Perfect Day to do that..